Today, our furnace went out. Driving all over town looking for a part when it’s 5 degrees outside is not my idea of fun. I definitely have more important and pressing things to do. I stopped at Starbucks for a Skinny Caramel Macchiato. Surely that would make me feel better. Nope, it didn’t. Now I wanted to stuff my face with chocolate or a freshly baked cookie. I hate stress eating!! It’s gotten worse in the recent past That’s another story for another day though. I pressed on with my irritating day and just did what needed to be done. Got the part I needed so that I could be half-way functional in my house. And the most important part, I didn’t want to share my king-sized bed with two children who kick every time they took a breath. Oh yeah…..and the teeth-grinding that they do. That’s just “lulls” me back to sleep. I hope you’re sensing my sarcasm. Anyways, back to my day. I was irritated. So I turned off my music and just drove. I live outside of the metro area and so going anywhere for an appliance part can be a trek in and of itself. So I had time to drive a long road and think. I’m pretty real when it comes to sharing things on social media platforms. Depending on the person you ask, you’ll get a varied response on whether that is healthy or not. Sure you can share too much. I’ve never once shared the details of that one time I had projectile vomiting. Maybe I will some day. I do however share a lot of personal issues that I have. And I am 100% of with that. Maybe you aren’t and you’re perfectly entitled to your own opinion. I take all of those opinions to heart. It’s not a secret that I’ve had a rough time the past year. Hell, it’s been a rough several years. A lot of my issues are formed at my own doing and I know that. Most often, they are due to the fact that I try to place others happiness above my own. Or that I value others’ opinions over my own. That’s not healthy. Respect for opinions and feelings is crucial but believing in someone else’s is greater than my own, is not. This can be through religion or spirituality or anything else. The point is that you have a path. You can chose the one that others lead or you can lead on your own path. In the past, I’ve always chosen the path that others have led. One reason being, that I always feel that there is something to be learned from people and I am willing to follow them or walk beside them. And that is true. But unfortunately, it has been to the detriment of my own well being and in the process, I haven’t had my own path to follow. Take and Breath and GO!! DO IT!! This thing called life is hard. I am moving forward in a new way of thinking and forming new relationships and either letting old ones pass or nourishing past hurt ones. Either way, I have to GO! Go where my heart leads me and not let others lead that way. Yep! I’m gonna “ruffle some feathers”, “rock the boat”, or whatever you want to call it. After 38 years of life, I am finally learning how to be the woman I am meant to be. Being a woman who is not only proud of what she believes in but also KNOWS that she believes in. A woman who is not going to live based on the standards of anyone else. It is a new me. It is a different me. It’s not the “me” that worries about what someone else is going to think of my thoughts or actions. I do have a loooooooong road ahead of me. My counselor is definitely going to get her $’s worth. But I owe it to myself to be real and so do you! 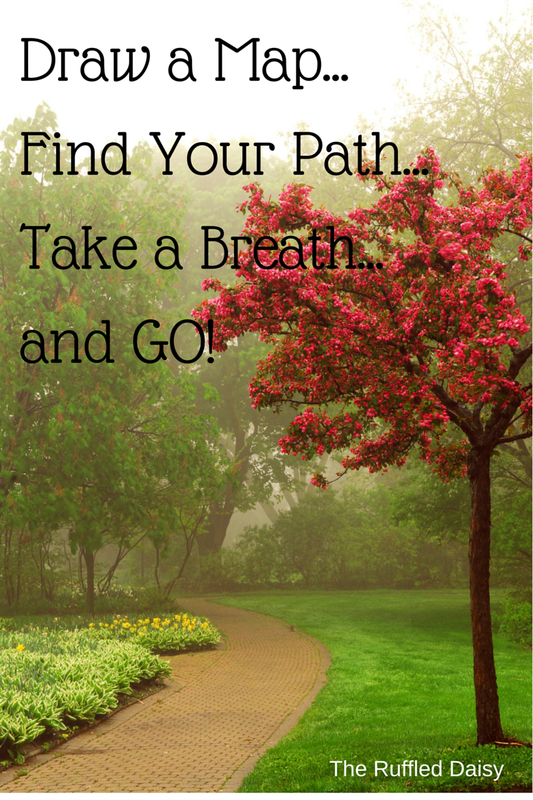 Go Draw Your Map, Find Your Path and Take a Breath and GO! Go and confidently live the life that you are meant to lead and not what others lead you to believe you should! !